SiteGround has now turned into one of the most reputable names in the web hosting industry. This information might amaze you that SiteGround has gained over 800,000 paid customers across the globe. SiteGround provides all kinds of web hosting services. It does not disappoint you even when your budget is not so high. SiteGround’s data centers are situated across Europe, Asia, and the USA. Exceptional site loading speed, satisfying customer support, and extremely reasonable pricing make SiteGround web hosting solution quite lucrative for every customer. When it comes to affordable hosting, the StartUp Plan offered by this platform seems quite attractive. However, if you are planning to host multiple websites and seeking premium resources, you should choose the GrowBig Plan. This SiteGround GrowBig Review will unveil all the crucial details about this package to help you in recognizing “whether you should buy it or not”. Why is SiteGraound GrowBig Better than StartUp? As you will check the web hosting plans on SiteGround, it will show three different packages. The first package is the StartUp package. It is for the users who seek fundamental features to start a website. When it comes to hosting multiple websites with greater web storage and other advanced features, the StartUp package seems quite unattractive. It does not mean it is totally useless. SiteGround’s Startup package offers plenty of features that other hosts’ expensive premium packages provide. You must choose GrowBig when looking for premium server resources and faster website loading times on any web browser. This package allows you to host multiple websites. You get more than 20GB of web storage which would be more than enough if you are serving 25,000+ visitors every month. The StartUp package does not include priority support but with GrowBig you get priority support from experts. All your tickets will be answered immediately whenever you face any technical issue. When it comes to repo creation, GrowBig offers pre-installed SG-GIt or Git. In addition, this package allows you to use numerous WordPress Plugins. It would not be possible to use high resource plugins or unlimited WordPress plugins on StartUP, and that’s why GrowBig is much better than the StartUp package. There are many other factors that make the SiteGround GrowBig package a better choice than its StartUp package. Continue reading to reveal how this web hosting package can satisfy your web hosting needs. If you agree the StartUp package cannot meet your web hosting requirements, SiteGround features bigger plans: GrowBig and GoGeek. We have already explained why GrowBig a better option. Now you might be wondering why GrowBig and why not GoGeek? So, let’s check a few facts about this plan to understand it is the right web hosting package or not. It allows you to host several websites and get various useful server resources. Your website works pretty fast. You get up to 30 daily backups on a daily basis. This package includes 20GB web storage, and you get an instant response to all your tickets. Tech experts at SiteGround will reply to your queries within ten minutes. This package includes premium tools, such as 1-click backup and restore tools. Increased email storage up to 2,000MB. In order to safeguard your eCommerce website, SiteGround offers a free wildcard SSL for 12 months. Your website can entertain 25,000+ visitors every month, and it will never crash and never load slowly on any web browser. The SiteGround GrowBig package costs only $5.95 per month, which is not too expensive in comparison to the shared hosting packages of competitor web hosting services. If the mentioned features satisfy your webs hosting requirements, you do not need to go for a higher plan. If there are no such demands, then you do not need the GoGeek plan. You are better off with GrowBig. Switching to GrowBig would be a better decision because thus you will get more advanced features than the StartUp package without spending a lot on web hosting. If your website or blog is growing faster, you need a website that is 24-7 live to entertain your customers. Though many big web hosting companies claim 100% uptime, their actions do not justify their claims. SiteGround has always chosen in-house crafted solutions to provide its users with top-quality web hosting services. We have gone through numerous reviews and people’s reactions on various forums and social media posts to verify SiteGround’s uptime claims. 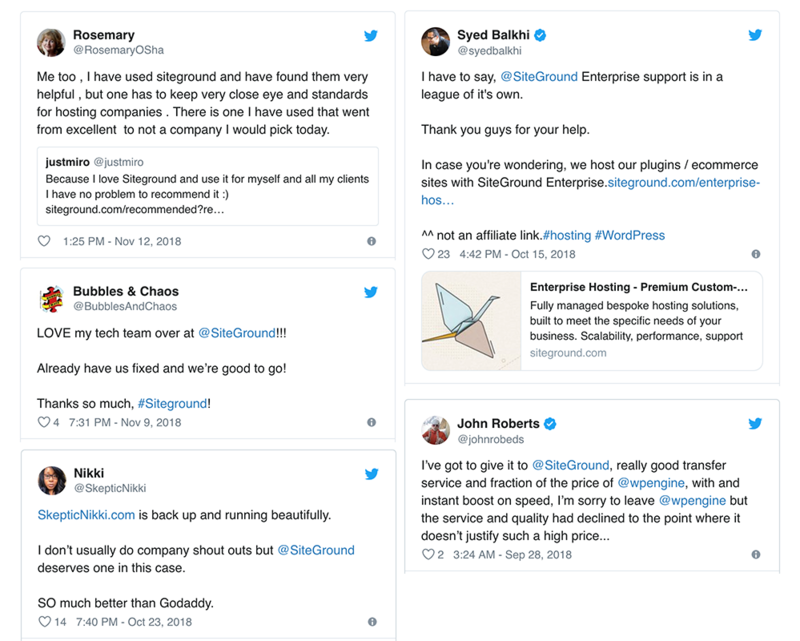 Most of the SiteGround customers are very happy with their service. SiteGround website hosting platform is developed on Linux containers to offer remarkable stability, especially when your website experiences unexpected traffic spikes. This web hosting platform was the first to offer the account isolation technology in order to provide clients with better security. SiteGround’s server monitoring system monitors all the servers within every 0.5 seconds. It proactively resolves any issue without requiring human supervision. That’s how SiteGround assures 99.99% uptime with GrowBig and other premium plans. If you believe only being 24-7 uptime is enough for your website to gain customers and make a huge profit for your business, it is a big mistake. Along with uptime the loading time also matters a lot. Many web hosting companies are entirely focused on increasing uptime to show numbers. But they often miss an opportunity of providing fast website loading time because of which they lose many customers. Many users have tested their website with the GrowBig package and experienced loading times of 722ms. It is much faster than the average loading times taken by other web hosting companies. SiteGround may not be the only that assures such quick page loading speed. However, this loading speed is simply exceptional for a $5.95/mo plan. In addition, no traffic spikes will slow down the loading times, and that’s why it is a fantastic plan. SiteGround (Coupon here) is the only web hosting service that offers managed WordPress hosting on all accounts. It is a special feature that matters a lot when you are launching a high-quality WordPress website. You might be wondering why it matters if you are new to this field. When you get the GrowBig web hosting package, SiteGround manages services for you in terms of security, speed, updates, support, and offers enhancement programs to make things simpler for you. This web hosting platform is developed on SSD that features in-house developed caching tool, known as SuperCacher. This tool is quite vital for maintaining the loading speed of your website. SiteGround assures its users about continuously monitoring for WordPress related bugs in order to perfectly protect your site with tailored WAF rules. Daily backups, regular plugin updates, and free WordPress updates make GrowBig, and GoGeek plans quite essential for WordPress users. If your website is hosted by another web hosting service and now you are choosing the SiteGround GrowBig package to host your site, it will migrate your website from the previous host within a day, For Free! Other web hosting services charge for this service (Bluehost charges whopping $149!) and they also take time up to 30 days. Though only one professional website migration service is offered, it will not be time-consuming. So, this feature also makes GrowBig an appealing web hosting plan. Many website owners choose free web hosting trials to test the performance of other web hosting companies. SiteGround does not offer any such offer. Instead, it offers a 30-day money back guarantee in case you are not satisfied with the web hosting experience. SiteGround is committed to providing the best experience, and if it fails, it will return all the money you have paid for buying the GrowBig web hosting package. SiteGround is hands down the best hosting provider when it comes to customer satisfaction. For a more thorough comparison, we can compare SiteGround GrowBig plan with similar plans on other web hosting plans. When a hosting company shows storage as unlimited or unmetered, I really hate it because it’s just not possible and it’s false advertising. It shows that all they care about is customer acquisition and not about providing quality. Good thing is, SiteGround clearly shows how much storage you get. That’s why it’s better than all mentioned hosts here. For more thorough comparisons, check out: SiteGround Vs Bluehost, SiteGround Vs InMotion Hosting, SiteGround Vs A2 Hosting, SiteGround Vs WPX Hosting, and SiteGround Vs MDDHosting. Here are some of the most frequently asked questions about the SiteGround GrowBig plan. Does SiteGround provide Cpanel on GrowBig plan? Yes. SiteGround provides the standard Cpanel on all their hosting plans including GrowBig. Is 20GB storage on SiteGround GrowBig plan enough? For most people, 5GB storage will be perfectly fine, but SiteGround provides 20GB storage in the GrowBig plan. If you are going to host only WordPress sites, you won’t need more than a few GBs because WordPress doesn’t use too much space. So 20GB storage is more than enough for most people. Does GrowBig plan has different server resources than StartUp? Yes. SiteGround StartUp plan server resources are termed as Essential and GrowBig server resources are termed as Premium. So both plans offer different server resources. The premium server has better resource allocation and fewer users on same server, resulting in much better output. Does SiteGround GrowBig offer free Site Builder? Yes. SiteGround provides free drag and drop site builder on all their plans. So anyone can create a functioning website easily without the need of a developer. How good is WordPress Support on SiteGround? SiteGround support is one of the best in the industry. What’s more is that SiteGround provides priority support to GrowBig plan and GrowGeek plan customers. Whatever WordPress related issue you have, you can get it resolved in minutes by contacting SiteGround support. They even help you with things they don’t have anything to do with, like WordPress themes, plugins or any self-inflicted issue. When it comes to WordPress Support, SiteGround is on par with WPX Hosting, which provides premium (and expensive) managed WordPress Hosting. Is GrowBig is the best web hosting package you can acquire? The answer would be no because GoGeek provides more server resources, staging, and no CPU limits. However, this package is a lot better than the packages offered by other web hosting companies. GrowBig is an ideal package if your website serves up to 25,000 visitors every month. No downtime, no slow page loading issues, and managed WordPress hosting makes it a wonderful web hosting package. Free website migration within 24 hours is a feature that none other web hosting service offers for free. Therefore, choosing the SiteGround GrowBig web hosting package would be a wise decision. Sign up using our discount link given below and receive an exclusive SiteGround discount, Free Domain, and other Freebies. Next Post: SiteGround GoGeek Review: Too Pricey For a Shared Hosting?